Why Use Tungsten Heater Device that Cannot Deform under High-Temperature? In hot wire CVD (Chemical Vapor Deposition) system, the energy of a chemical reaction is provided by the tungsten wire, the substrate is also heated to a certain growth temperature by thermal radiation of the tungsten wire, and uniformity of the temperature of the substrate surface would be different due to the shape of the tungsten wire. One of the most important factors of film nucleation and its uniformity growth is the uniformity of substrate surface temperature. In typical laboratory CVD small and medium systems, the tungsten wire is wound into a solenoid-shaped tungsten heater. This winding method is relatively simple that the outer diameter of each turn is the same. But using a solenoid-shaped tungsten heater, temperature distribution on the surface of the substrate is uneven enough, using a vertical projection line of the substrate surface of solenoid axis as a reference line, if the substrate surface is far away from this line, the temperature would become lower. What’s more, the temperature of the middle of the solenoid itself is higher than the ends, which is one of the reasons for uneven temperature distribution of the substrate surface. On the one hand, the solenoid-shaped tungsten heater will result in an uneven temperature of the substrate surface. On the other hand, in the CVD growth process, the tungsten wire usually deform under a high temperature, high temperature of the middle part would hang down and bend, led to the evenness of temperature distribution of substrate surface becomes lower, eventually makes it impossible to continue the CVD growth process, it must be replaced a new tungsten wire before continuing. As a result, it will have a certain impact on test results. Because the new tungsten wire can not exactly the same as original tungsten wire under various conditions, which will definitely affect the reliability of comparative test results. In large CVD(Chemical Vapor Deposition) system (diameter of the reaction chamber is longer than50cm), in order to form a large area and uniform film, using a large area and fence Czochralski tungsten wire to eliminate the uneven temperature and deformation problem of heating wire. But during film growth, large-scale CVD system usually have greater power and gas consumption, and when the arrangement of Czochralski tungsten wire, total current through the hot wire will be great, generally at 100 amperes or more. Therefore, it needs high current and high power hot wire heating transformer and a corresponding device for cooling systems. The device is relatively complex, which is not suitable for doing research for an experimental basis. 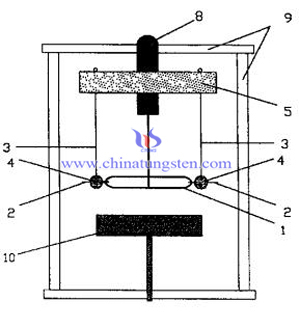 For the core heating section of tungsten heater, it can be improved by the following measures to solve the above problems. 1. Tungsten wire can be wounded into a flat ring, and it would be molded in a one time with a special material mold. 2. Using the high temperature boron nitride ceramic rod whose melting point is higher than 2400 ℃ to be fixed with tungsten wire. 3. Put and fix the boron nitride ceramic rod on the upper end of the electrode, so that the whole heating tungsten wire can keep parallel with the substrate surface. 4. 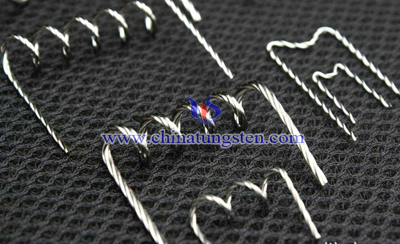 Before using the new tungsten wire, it should be through the stress treatment. After the new tungsten has being wounded and fixed, in an normal growth atmosphere, dong the annealing process for a long time at low temperatures to eliminate stress generated in the process of wound and stereotype. The heating process is: every time the temperature of tungsten wire rises 100 ℃, then heating for 2 hours, until the temperature of tungsten wire reaches the growth temperature. This is a specific improvement measures for the tungsten wire wound, this kind of tungsten heater device will greatly improve the efficiency of the subsequent coating. 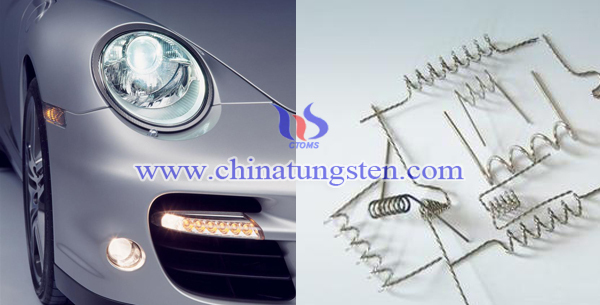 In order to solve the problems of poor aluminizing performance effect of automotive lighting, long production cycle, the poor quality of the protective layer. Through the following improvements, it can further enhance the quality of the aluminum layer. 1. The injection molding: put the raw material into a mold and process it into parts. 2. Edging is to remove four sides of parts. After inspection for the exterior, remove the substandard products, blowing qualified products by air gun, and finally put parts into the transporter and transfer them to the aluminum machine, hanging the parts in fixture. 3. Pretreatment, aluminizing, the protective layer: put the part into aluminizing device and the close it for evacuation, when pressure reaches 2.0E-2torr, the two high-pressure aluminum sheet of chamber glow, directional ion flow generated would bombard the surface of the light to disperse gas of the surface and produce a very fine steel pits of the surface of parts in order to increase the adhesion of the aluminum layer and the surface of the part. After the pretreatment, continue to evacuation, when high vacuum reaches 5.0E-5torr, heat tungsten wire to melt and gasify the aluminum ring to aluminizing. The cavity is filled with silicone oil, and high vacuum converses to low vacuum, when pressure reaches 1.5E-2torr, glow generated by two high-pressure aluminum sheets would ionize silicone oil into Si02, then it would cover on the surface of the aluminum layer, in order to increase mechanical strength of aluminum the layer and prevent aluminum layer from being corroded and oxidized by air. The characteristics of aluminum machine evaporated aluminum tungsten heater comprising: tungsten wire is provided with a ring of aluminum with a purity of 99.99%, purity of tungsten wire is 99.99%. 4. Place the finished parts into the transporter and transfer them, and then inspect and pack the article by workers. Car light is an important device for ensuring the driving safety, and it is also one of the most important outer parts. With the innovation of science and technology, and the rapid development of automobile industry, so the automotive lighting requirements are also getting higher and higher. Quality of reflector lamp directly affects the car's lighting effects. Conventional lights are made through molding, most of them use aluminizing method to the make reflector film to increase the reflectivity of the surface of the light. Domestic aluminizing technology includes ion bombardment, aluminizing, put on protective layer. In order to prevent the aluminum layer from oxidation and corrosion, these three aspects are carried out separately. Pretreatment relates to the adhesion of the aluminum layer, which affects the quality of the film, and the thickness of the protective layer and the aluminum layer have a certain influence in the quality of the lights. If the production cycle of aluminum is too long, it will increase the cost of production, and the quality of the protective layer becomes poor. Therefore, to solve this kind of problem is especially important. This kind of aluminizing process with tungsten heater can make effect of component will be better in aluminizing, reducing the failure rate of aluminizing to some extent. Clean air molecules, water vapor and grease adsorbed on the surface of the base material of the lamp in pretreatment, and roughen the surface of the lamp, which can greatly improving the bonding strength the surface and the aluminum layer. In addition, transfer upper and lower parts by transporter can reduce dust pollution, which can improve the effect of the lights aluminizing. This process not only improves the quality of the protective layer, but also shortens the original production cycle of aluminizing from 26 minutes to 6 minutes, so it has reduced scrap rates and input costs for lights. TiO2 photocatalyst due to its excellent photocatalytic performance which has the advantages of light corrosion and chemical corrosion, non-toxic and of low cost has become a topic for many scholars. Titanium dioxide powder is frequently studied at present, however, powder photocatalyst used in water treatment usually require power to maintain the suspension. It was stirred with another catalyst separation and recovery of difficult practical application is limited. Anodic oxidation method for the manufacture of titanium substrate surface titania nanotube array films not only solve the problem of catalyst separation and recovery, and its special tubular structure can provide access to electronic transmission, reducing the composite photo-generated electrons and holes to a certain extent, help improve the efficiency of photocatalytic reaction. (1)Wash the titanium sheet which has a thickness of 0.1mm, 99.9% purity titanium sheet is cut to size 20mm x 45mm, followed by surface degreasing. After oxide treatment, rinsed it with deionized water and clean air. (2)After cleaning, anodic oxidation 1h in the electrolyte, rinse with deionized water, then air dried, and then a heating rate of 5 °C / min was raised to 450 °C. Calcining 1h to obtain a surface with titanium dioxide nanotube. (3)The surface of the resulting titanium dioxide nanotube thin film of titanium sheet is immersed in an aqueous solution of sulfuric acid concentration of 0. 2-1.0M in 2-6h, remove dry and then immerse in a concentration of 0.3M aqueous solution of ammonium paratungstate for 2h, remove the air-dry after the muffle furnace. The temperature increasing rate of 5 °C/min was raised to 450 °C, calcined for 1h to obtain tungsten oxide modified titanium dioxide nanotube. The object of the present invention is a method for preparing niobium-doped tungsten oxide nano-materials for the deficiencies of the prior art and development, which is characterized by the introduction of transition metal ions niobium WO6 octahedral structure in the entire octahedral structure within large specific surface area, and changes the internal arrangement of nano tungsten oxide. The change of the electron holes and defects which change the tungsten oxide nano particles for UV absorption. (4) The Teflon reactor is sealed and placed in an oven program, heating and cooling rates of 1 ~ 2 / C/min at a temperature of 150 ~ 200° C and preferably 170 ~ 180 °C of hydrothermal treatment for 24 ~ 48h. Remove the reactor, cool to room temperature. The reaction product is washed with distilled water until neutral, respectively, at a temperature 80 ~ 100 ° C in an oven dried for 24 ~ 48h, then obtain niobium doped tungsten oxide nano materials. 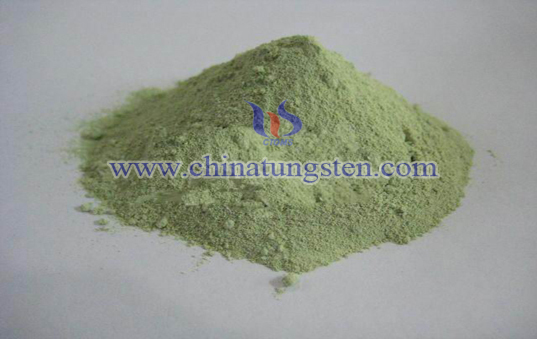 Tungsten oxide has excellent performance in electrochromic, catalysis, gas and other aspects. The composite oxides - tungsten bronze metal oxides generally refer darker colored metallic luster, and usually a metal conductor or metal semiconductor. Currently, cesium tungsten oxide, due to its low resistance and excellent visible light transmittance and near-infrared shielding properties, is widely used in the preparation of the conductive film used in glass septum thermal insulation coating. 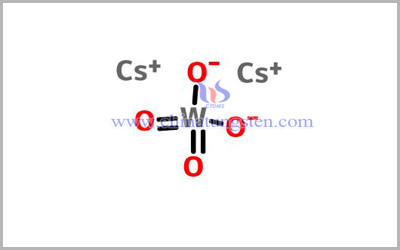 The traditional preparation method of cesium tungsten oxide uses tungsten, tungsten acid source, Cs/W molar ratio of 1: (2.857~100), at 180~200°C reaction conditions for 1~3 days. The preparation takes a long reaction period, is of low efficiency, which is not conducive to industrial production. (1) In accordance with Cs / W molar ratio of 1: (1.5 to 2.8), weigh cesium salt and tungsten salt. A chelating agent and alcohol reagent are added and reacting under 170 °C condition for 3h. Then mix them up. (3) The Step (2) was obtained by reaction of an alcohol wash, centrifugation, at 80°C under conditions of complete crystallinity dried in vacuum to obtain cesium tungsten oxide powder. Tungsten oxide micron pipe has perfect structure and excellent electrical and mechanical properties in gas sensors, transparent electrically conductive electrode, electroluminescence and photoluminescence, etc. Compared with the conventional tungsten oxide material, the tubular structure has a larger surface--volume ratio. In the gas-sensing, electroluminescence and photoluminescence process, the surface material plays a major role, so the tubular structure is expected to significantly improve the performance of tungsten oxide in the above areas. Currently, the technology for preparing the tungsten oxide of the tubular structure is still very limited. By using the electrode heating tungsten disulfide in an oxygen obtain a tubular structure of tungsten oxide. The method is mainly connected to the use of electro-polished at both ends of the tungsten electrode as a heating source. The ultrasonic tungsten disulfide powder dispersed in acetone, heated tungsten disulfide with a straw before acetone dispersed droplets to said tungsten, so that tungsten film is formed at both ends of the electrode conduction heating reacted. The entire reaction is carried out in a vacuum chamber, argon (Ar) as a shielding gas, are passed through a small amount of oxygen. This method allows the tungsten filament heated to 1100 ℃ -1400 ℃, obtained after the reaction at the surface of the tungsten wire of the tungsten oxide fiber and other nanostructures. (4) The natural reaction chamber was lowered to room temperature, the chemical composition of micron pipe by WO3 · xH2O dehydration becomes hexagonal tungsten oxide: h-WO3. The invention relates to the use of tungsten oxide or tungstate to increase the heat-input amount of near infrared radiation. It was found that these materials exhibit a distinct higher effect than other known Infrared Radiation(IR) absorbers although absorbing the same amount of energy. This is very surprising and cannot be explained so far. Tungsten bronzes incorporated in coatings led to a much higher temperature increase upon irradiation with IR than expected according to its spectral absorption capacity. The temperature increasing measured was distinctly higher than found with other known IR absorbers and reached almost the temperature observed with carbon black. Many technical processes (like laser welding and marking of plastics, Near Infrared Radiation(NIR) curing and drying of coatings, drying of printings, laser marking of paper, curing and drying of adhesives, fixing of ink toners to a substrate, heating of plastic pre-forms etc.) require an efficient, quick and focused local heat-input through IR radiation. The conversion of IR radiation into heat is realized by placing appropriate IR absorbers at the place where the heat is required. Carbon black is a well known efficient IR absorber for such processes. But carbon black has one big draw back: that's its strong black colour. Thus carbon black cannot be applied for coloured (other than black or grey), uncoloured, white or transparent systems. For such systems a "white or colourless carbon black" is a great technical need. Very surprisingly the tungsten oxide material of the present invention comes quite near to this target profile, although it is slightly bluish to grayish. But due to its surprisingly high efficiency of conversion of IR radiation into heat, this tungsten oxide material can be applied at such a low concentrations that its own colour is acceptable for most applications. The same is true for transparency: the material (plastics, coatings) containing this tungsten oxide remains also highly transparent. The NIR curing of coatings can be used for all type of coatings including both pigmented and unpigmented coating materials. Depending upon the nature of the organic binder, coatings may comprise solvent or may be solventless or water-free. They may also comprise fillers and other additives in addition to the pigments. Any kind of coating is suitable in the method according to the invention, for example, powder coatings, clearcoats, high-solids coatings, effect coatings, high-gloss coatings, silk-finish coatings, matt-finish coatings, spray coatings, dip-coatings, pour-coatings etc. The tungsten trioxide is a η- type wide band gap semiconductor oxide (band gap of about 2.8eV), since the crystal memory in the atomic or electronic defect, the compound stoichiometry deviation occurs, the charge carrier concentration is mainly determined by the concentration of stoichiometric defects (such as oxygen vacancies), it has excellent catalytic and gas sensing performance. Tungsten oxide based gas sensors for the N02, H2S, 03, and NH3, and many other environmentally harmful gases sensitive response, especially for low concentration of nitrogen oxides show ultra-high sensitivity. 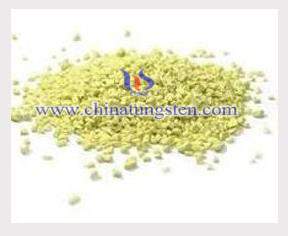 In addition, the tungsten oxide also has a photochromic, electrochromic properties, photocatalysis, field emission and solar cells have a wide range of applications. (1)In a reaction vessel, the soluble tungsten salt dissolves in deionized water. Dub the concentration of the solution to 0.10~0.80mol L, place 100 ~750W power ultrasonic generator under ultrasonic condition oxalic acid. (2)0.12~0.47mol of oxalic acid is added, the concentration will be dissolved as 1.00~4.50mol / L inorganic acid solution. 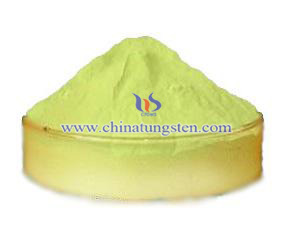 (3)It was slowly added to the above solution to PH value 0.50~3.50, continued ultrasound 20~150min, the yellow precipitate was washed by centrifugation, and the resulting yellow precipitate was dried at 50~80 °C under 4~20h. Soluble tungsten salt is tungsten hexachloride (WCl6), sodium tungstate (Na2WO4.2H2O), ammonium metatungstate [(NH4) 6W7O24.6H2O] and paratungstate [5 (NH4) 20.12W03.5H2O] one; the inorganic acid are sulfuric acid (H2SO4) 'hydrochloric acid (HCl) and nitric acid (HNO3).